Cleopatra Consultants Limited was formed in 1991 by the principals, who have over 60 years of IT experience between them. Our list of clients includes a number of household names in finance, manufacturing and services. We offer consultancy in business systems, email solutions and web solutions for companies of all sizes. 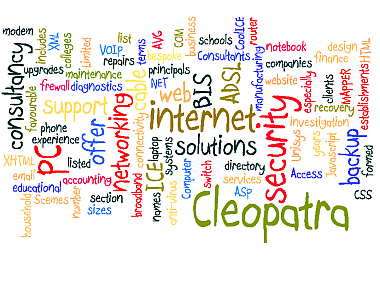 We offer especially favourable terms to schools, colleges and other educational establishments, and are listed in the Scemes directory under the "Computer and Internet Access and Security" section.